A big thank you to Northern Virginia Magazine for including me in their April issue! The feature profiles five area blogs - also including Young House Love, Pretty Handy Girl, JWS Interiors, Pure Style Home - and I'm thrilled to be in such great company. You can read the little blurb on AO here... (seems to be a slightly different feature online). 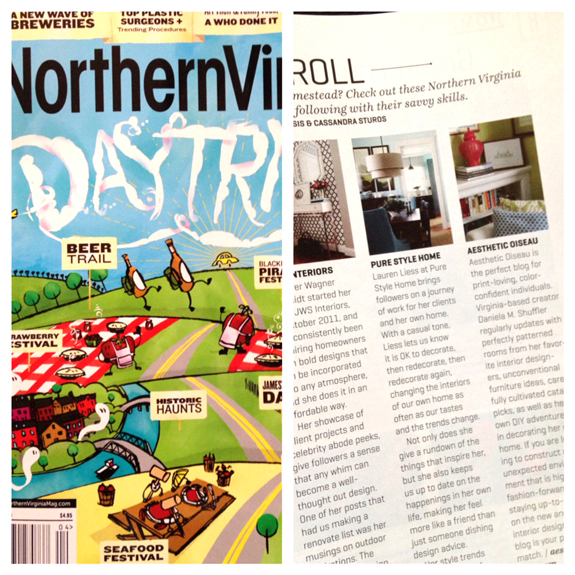 This issue also features a craft beer trail from Northern Virginia to Richmond...double bonus. A huge and well deserved congratulations Daniella!! Fantastic recognition, Daniela! Ana Claire should be so proud of her mommy! Congrats lady! So awesome and well deserved!